The moment you have all been waiting for! The manuals arrived from the printer and next week they will be available for purchase. If you have taken a certification in the past you will automatically be mailed a link next week to purchase one. When you go to check-out from the link you need to tell us which session and instructor you attended so we can verify your records. One manual per person. Pay Pal may tell you you can order more, but you cannot. Meanwhile, please DO NOT call or send us an e-mail about buying the manual and tell us you were not sent a link yet. We will be sending out notices all next week. If you do not get a link by May 10th, then you may contact us. NOTE: We will only be selling manuals until June 30th. After that date you will have to re-take a certification class for $40 to be able to get a new manual. June 6th, Arlington, TX Taught by Sally Lynn and Jenn Balcer Open to Stores & Designers - filling fast! Thank you to everyone who welcomed Jenn to our team! 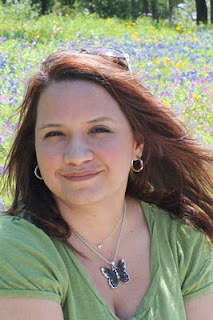 We are looking forward to a busy Summer of workshops, so Jenn will be a big help. This is a perfect tutorial Marianne! I was at the Phoenix certification class and played with Y11 and Y15 for blonde...liked it and so I'm going to go purchase these colors today. Welcome to Jenn...your tutorials are always awesome and I love your work! 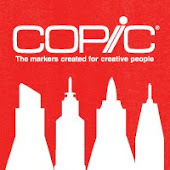 Congrats Jen, and congrats to the winners from the other blogs on the team, and thank you all for welcoming Jenn to Copic! What a great weekend! 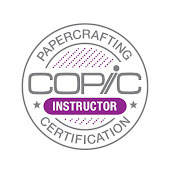 I had a chance to visit a couple of fabulous stores in the Phoenix area, meet the new Spellbinders Design team, and assist Jennie at the Certification. Today I want to share some great news, show you a simple tutorial, and give you a chance to win a PRIZE! One of the questions that came up a number of times was how to color hair. We were coloring a really cute Hero Arts stamp of a little girl (which I didn't have here at home, so I drew a similar picture to color). 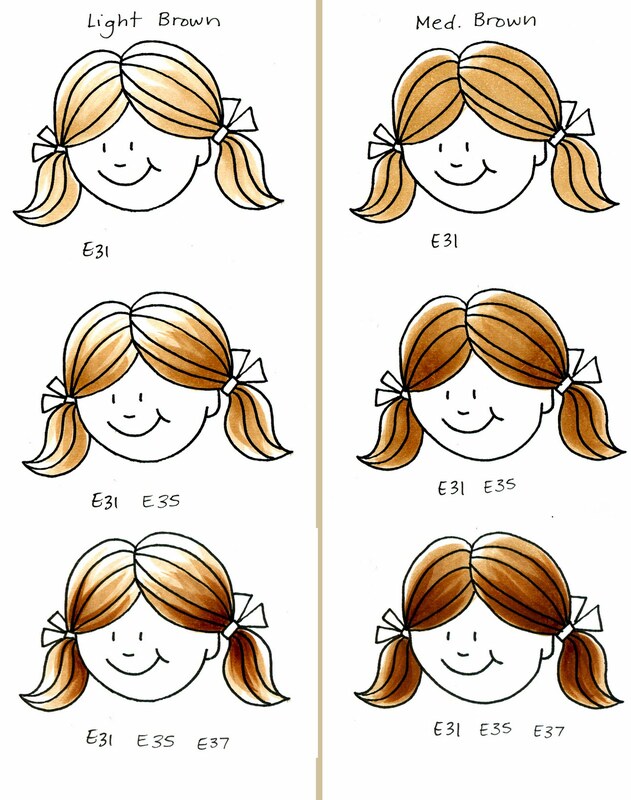 I've talked about coloring hair before, but it's a subject that is always handy to review. First of all, hair comes in many colors. You can choose almost any color combination of browns, yellows, YR, R, grays... you get the idea. Experiment with lots of colors, and write down the ones you like. You can use the same colors and get different results depending on how much of a color you use as well. Look at these two examples of brown hair. When coloring hair, start light, then work in your darker tones. Streak color in the direction of the grain of the hair. On both of these examples I started with E31. For the lighter hair I left more white, whereas on the darker head I darkened the E31 by coloring slower, still in streaks, and not leaving as much white. With the lighter hair, I used less E35 and E37 on each step than I did in the second example. As you can see, the results very greatly just by how much darker color you use. Note: On hair, I don't usually layer more light over the top of my darker colors, or else the colors will blend together. In this case we want to keep the streaks, since it makes the hair look more believable and natural. Hair color can change dramatically if you change the base tone or add another color. People frequently ask how to get black hair. Since Copic makes so many shades of gray you would think that you could make black from any of them, but carefully test each color combination. Look at the example. The cool grays make a very different gray than the warm grays. In my opinion, I think the cool gray looks more black whereas the warm grays look more like her hair is fading to gray. Again, it's personal preference. In the red head example here, you can see that the hair with a yellow base tone looks very different than the hair without. I like to add a yellow base simply because I think the color looks richer, but again, it's a personal choice. Don't be afraid to experiment! When you want to show dimension, choose your light carefully. 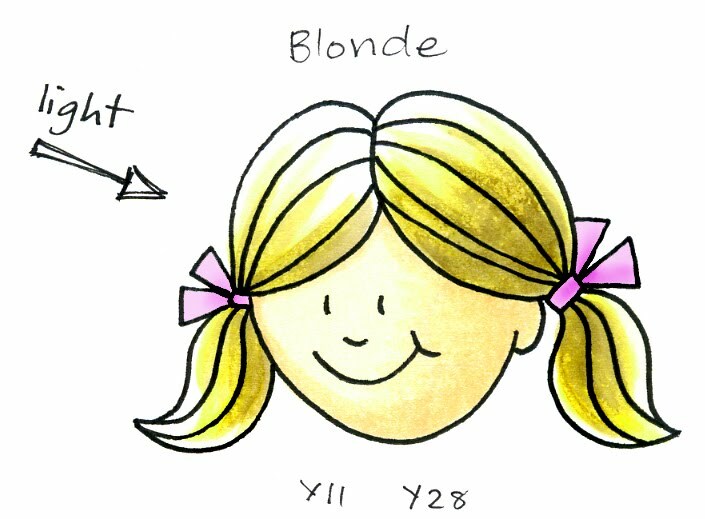 Since the girl's face in this example is turned to the Left, then I am going to have my light coming from that direction, that way the front of her face has the strongest lighting. Then, the side of the hair closest to the light will have less color, whereas the side in shadow will have slightly more dark color. This helps give dimensionality to the image. Jenn has been in papercrafting for quite a while. Most recently, she worked at Splitcoaststampers, helping with all the hidden things that make it such an exciting place. Now that she's had a bit of a rest, she's ready to jump in and help Sharon and Lori with Copic Certification classes in the middle of the country. If you don't know Jenn, you can get a chance to meet her this year at Summer CHA in Chicago, along with many other members of our fabulous team. To welcome her to our team, we are offering a giveaway. Leave a comment on my post today for a chance to win a free Copic empty 24 pc. Wallet (retail value of $15). Tell us what YOUR favorite colors to use on hair are (give us some good ideas! ), and give Jenn a big welcome. I will draw a winner on Saturday morning. (contest open in North America only, sorry). 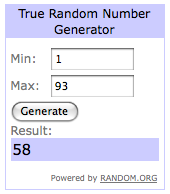 Be sure to leave an e-mail address so I can contact you if you win. Check out the blogs of our other team members sometime this week for a chance to win as well (some of them have other contests and sneak-peeks going on, so look at all the exciting things happening in the blog world). Meanwhile, I'll be heading up to demo tomorrow in Seattle at the new Blick Art Store- I hope to see you there. Have a great week and thanks for welcoming Jenn! 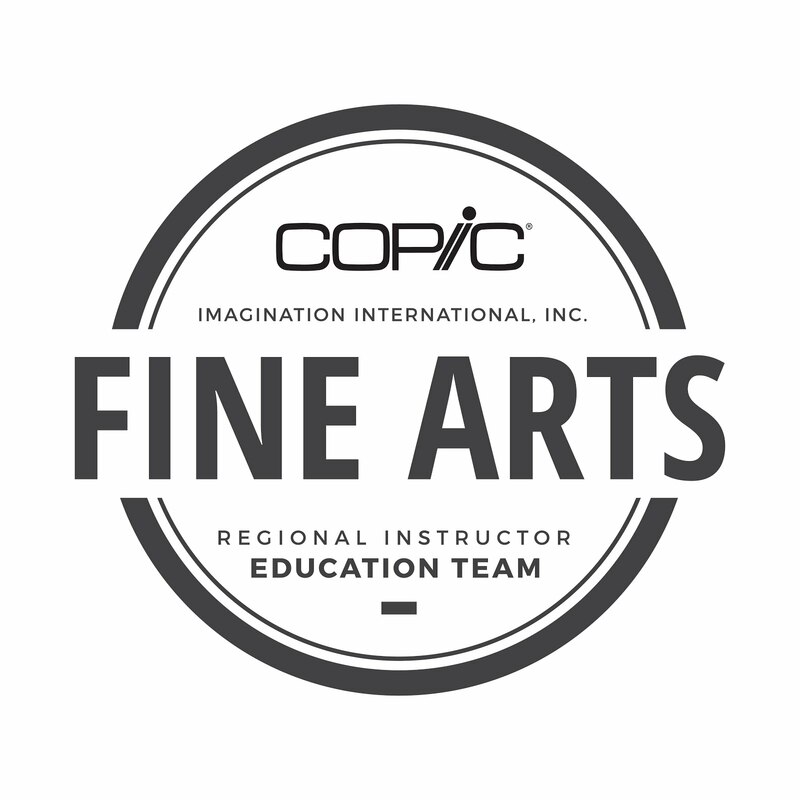 This weekend I will be helping in Phoenix at the Copic Certification. One of the other things I will be doing is a special workshop for the new Spellbinders Design team, however, I don't want you to feel left out of what I will be talking about. Next week I will be at the grand opening celebration of the new Blick Art Store in Seattle, WA. I will be demoing on the 22nd, from about 2 to 5pm. 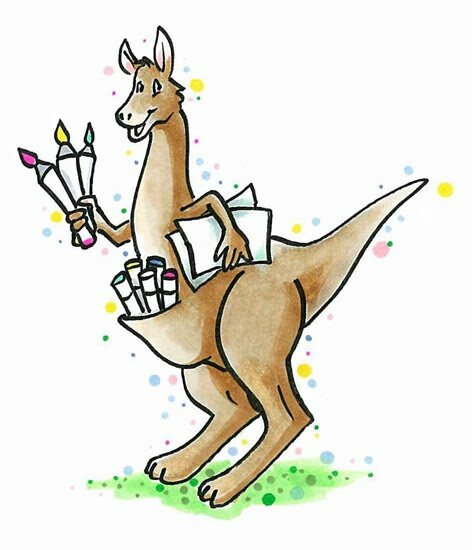 Come join me for some prizes and to have your Copic questions answered. The first subject I'll discuss in Phoenix is based on this post I did last year on composition. Read through this post and I hope it inspires you to look at your projects a little differently. These concepts are arbitrary, so you can choose to agree with them or not. Tenderness - Love - Friendship - Care - Support - Protection - Affection - Compassion. Fun Color Theory The last links I wanted to direct you toward are all about colors. ColorMatters.com This is a fun site to just dig around in and find all sorts of interesting factoids on color. They discuss everything from Pink jail rooms to the Egyptians bathing in different colors of light. For interactive color playing you can go to the Kuler website (requires flash plugin), where you can type in a word and it will pull up a color scheme. This is always handy if you need a new color idea for tired, old concepts. I hope you all have a great weekend, and I'll see you in Phoenix and Seattle! Next week, stay tuned as I have some exciting news and a fun giveaway. I've been busy getting ready for my trip to Phoenix this weekend, but I realized I needed to update the list of classes coming to a town near you. There are lots of opportunities on the horizon, so look for more classes coming soon. May 16th, Concord (Charlotte area), NC Taught by Sally Lynn Open to Stores & Designers - filling fast! June 6th, Arlington, TX Taught by Sally Lynn Open to Stores & Designers - filling fast! As details are gathered together I just wanted to keep you updated. Lori and I will demoing at the Scrapbooking Industry Australia (SIA) trade show in Sydney, Australia on May 5th. You can read our bio's on the show's blog site, here. Lori and I may also be a guest speakers leading discussions, so stay tuned for more details. The show runs May 4th & 5th, and we will be in the X-Press Graph-X / Copic booth on the 5th. The certification classes in Sydney and Melbourne are filling fast, so if you want to attend you need to contact us right away. We look forward to visiting the land down under! !